Not far from our float cabin home, logging roads reach deep into the back country. These paths, carved out of the deep forest, allow us to explore on foot and by quad. The extensive network of trails are also filled with logging history if you know where to look. This week, Wayne and I took our quads up Heather Main (a main logging road) from Powell Lake near the Chippewa Bay logging dock. There are two large pieces of equipment abandoned along this well used road. When machines were no longer operational, it was often easier to just leave them in place. Now it's like riding through a living museum. This trip, we went as far as the first shovel built by Bucyrus-Erie of Milwaukee, Wisconsin. Where did the summer go? It seems to have come to an abrupt end here in Coastal BC. Up the lake, gardening in my float garden and deck pots is slowing down. I've pulled all of my garlic and onions to dry and store. My potatoes will be the next to come out of the ground. My snow peas and runner beans are dwindling, so I'll let them dry on the vine for next year's seeds. The only thing that hasn't ripened yet are my tomatoes. Hopefully they'll get going before it really turns cold. As I've pulled my summer spinach and lettuce, I've replaced it with chard and kale. That should carry me through the fall and winter for some fresh greens to go in salads and soups. I also have carrots and beets "stored" in the ground. For me, they last better that way. Not only did we get great sunrises and sunsets while anchored this week at Rebecca Spit Marina Park in Drew Harbour, the full moon rising over the trees was really spectacular. This week Wayne and I had a wonderful cruise to Heriot Bay on Quadra Island. We anchored in nearby Drew Harbour for three nights on the hook. It was a little choppy the evening we arrived, but after that it was calm, sunny, and very warm. This spot is well known for some pretty spectacular sunrises. As you know, I don't have a lot of space in my garden. Consequently, I grow things in pots on the deck whenever possible. For the last three years I've grown garlic in three small pots. But this year is the first that I've harvested a big crop for my efforts. In fact, I have more garlic than I will ever be able to use. Like onions, you wait for the tops to start to fall over. Then I carefully pulled the bulbs and let them dry in the sun before tying them in bundles to hang. First, I left them outdoors in the shade to dry. Once that was done, the odour dimished and they were ready to take indoors for storage. Both my garlic and onions hang on a clothes line in our storage room. It's a dry environment that encourages them to last well into the winter month. When we're in the middle of one of the warmest summers we can remember here in Coastal BC, starting a fire in our woodstove is the farthest thing from our minds. But it's a great time to start filling the woodshed, giving the wood plenty of time to dry before the rainy season. Often wood floats right up to our deck. Other times it's "donated" by a friend. 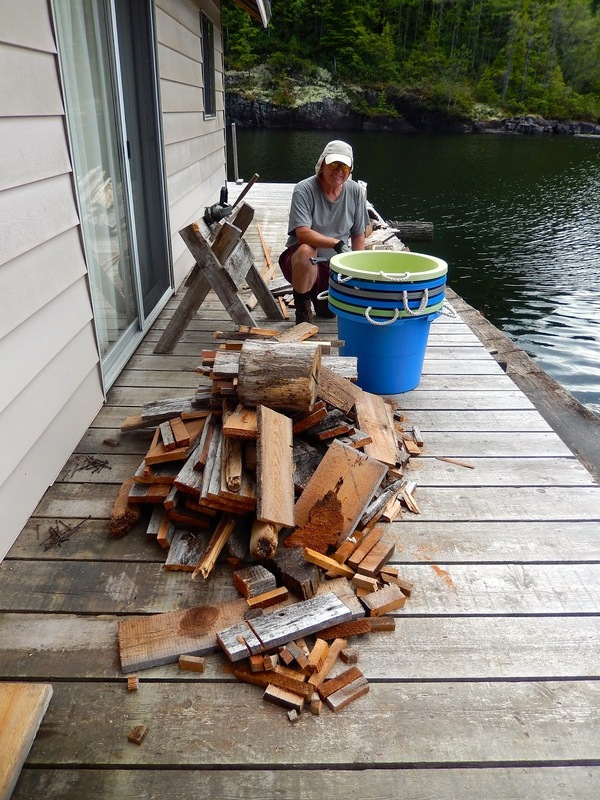 Our good friend John refurbished his cabin's boat dock with new cedar boards. That meant the old ones had to come off and be discarded. We gladly accepted the used wood. Cedar burns well, and the small boards make good fire starters. Wayne and I first had to remove the old nails, but the wood was soft enough they were easy to pull with a hammer. We saved the good ones for John to use again Save that nail! Then we cut up the larger boards into stove-size pieces. We carried our booty back to the cabin in plastic tubs. We split the logs from our last cutting and stacked the new boards in between. That way we will have some with each load we take into the cabin for burning. Each year I plant onions from sets. They are reasonably priced at about $3.95 for a net bag of 80 bulbs. This year I only planted yellow onions. Because onion sets are usually available only in the spring, I purchase an extra bag to store in my refrigerator for mid-summer replanting for a second crop of green onions. I plant the sets about one inch apart. When they're six inches high, I start thinning and use the sprouts in salads. The remaining onions then have enough room to mature into bulbs. Because my garden is small, it is difficult for me to implement crop rotation which helps reduce the effects of pests like onion maggots. That means I have to watch carefully and pull my onions by mid-July to prevent excessive damage. Onions are ready to harvest once their tops fall over. Some onions will form flower stalks. I cut them out as soon as they appear. If the flower stalks are allowed to progress, the onions will be poor keepers. To cure the onions, I first let them dry in the sun. Then I wipe any excess dirt off the bulbs using a dry paper towel. Lastly, I tie the bulbs into small bunches by their tops. Small onions and those that lost their tops to into the net bags I saved from the sets. The bags then get hung for the drying process. I hang the onions outdoors under the eves in a shaded, dry, warm location until the outer skins are dry. Once the skins and tops are dry, the onion odour is diminished. At that point, I move the bunches indoors for safe keeping and use during the fall and winter months. When I need an onion, I just cut one from the bunch. Pretty handy. Plus, they make an interesting "decorative" item in the cabin. I lose a few smaller ones to dehydration, so I use those first. The larger ones will last me through the following March depending on my cooking plans. While we were anchored off Gibsons Landing, a classic trimaran was floating on the hook next to us. It's hull matched the beautiful blue sky and sea. Here's a story about the owner. He sounds like a very interesting individual. The bio says that he purchased the three-quarters built 48-foot trimaran, finished the construction and christened her the Whale's Way. The website says that after completion, he sailed her "seven eighths of the way round the World, from Toronto to Victoria." That must have been quite a voyage. At the stern, she is all decked out with skookum solar panels and a wind generator just like we have up the lake at our cabin. During our recent cruise on the chuck (ocean), our destination was Gibsons, BC, to see our friends Ken and Sam. Our first night out, we stopped in Ballet Bay on Nelson Island. There was no rush, so we slept in and got a mid-morning start. Our route followed the shoreline of the Sunshine Coast. We passed some previous anchorages including Buccaneer Bay on Thormansby Island and Secret Cove. As we continued down the coast, we cruised through Welcome Pass. On our right was Merry Island with it's prominent lighthouse on the south end. The Merry Island Lighthouse was built in 1903 and is now a Canadian Coast Guard facility. Gibsons Landing is the waterfront portion of this bustling community at the beginning of the Sunshine Coast. Gibsons is easily reached from Vancouver by BC Ferries. It's also a hub for commercial and recreational maritime activity. It was also the location for the popular Canadian television show The Beachcombers. We anchored outside the breakwater and used the new public dock to meet our friends for dinner at Gramma's Pub. There are lots of other restaurants and shops to visit. This morning we started the day with North by Northwest, a popular CBC radio program. 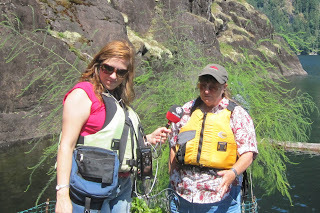 Margaret Gallagher guest hosted for program regular Sheryl MacKay. Wayne and I listen to CBC radio at our float cabin home. We may be too far from town for television, but radio comes in just fine. You can give CBC a listen using this Internet streaming link. In July, NXNW Associate Producer Willow Yamauchi joined us at our float cabin for an interview about our off-the-grid lifestyle, and my floating garden. Both were highlighted in today's on-air program. Thanks Willow for including us on this iconic BC program. Click here for a link to the interview portion of the program. NOTE: The audio player will come up in a separate window. Willow was the perfect person for this interview. She grew up locally (near Lund) and in a float home (on the ocean). She could really relate to our experiences. You might enjoy reading Willow's book about that time of her life, Adult Child of Hippies. 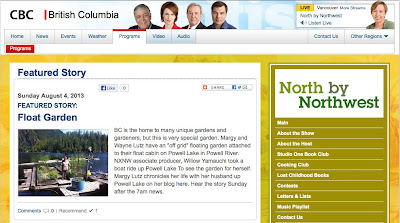 Want to know more about Wayne and my off-the-grid lifestyle in a float cabin on Powell Lake in Coastal BC? Here are links to several books. They are all available in print or e-book formats. Last week Wayne and I took a short cruise down the Sunshine Coast from Powell River to Gibsons to visit friends. Our first night out we stopped in Ballet Bay. It isn't that far from Powell River, and it's a well protected anchorage in a beautiful location. This was our first cruise with our cat Stick Tail. You can read more about his cruise here. Because of that, we didn't want to go too far just in case he didn't like the new experience. Fortunately, all went well. Ballet Bay is on the west side of Nelson Island on the Sunshine Coast. And we had plenty of that. Afternoons in the summer can get pretty choppy out in Malaspina Strait. But as soon as we rounded the tip of Hardy Island, it became calm and smooth. There were already a few boats anchored in the medium sized bay, but we found a great spot tucked into one corner.